1. Peel skin of apple, mesh and put aside. 4. Blend tomato, rasam powder, turmeric powder, salt, apple with some dal water in a dish and cook. 5. At the point when the crude scent dies down, include some dal water, pepper powder, some water. 6. At the point when air pockets structure on top, expel skillet from the stove. 7. Heat a little oil in a griddle. 8. 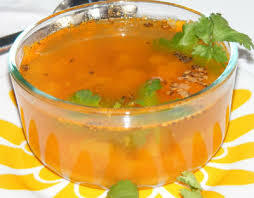 Include mustard, curry leaves and when mustard splutters, add to the rasam.